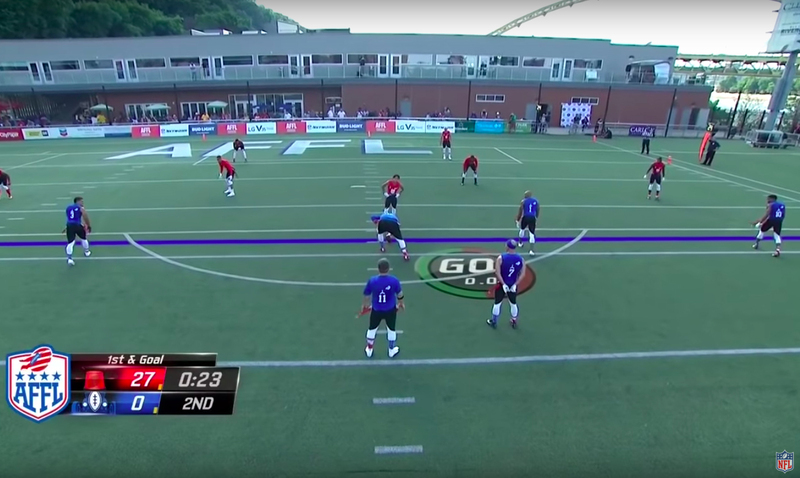 After a successful pilot game last year, the American Flag Football League (AFFL) is back in action this summer with the U.S. Open of Football (USOF) Tournament. 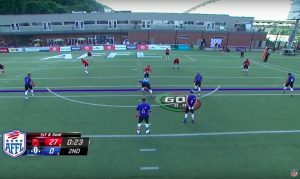 The final 11 games of the tournament kick off NFL Network’s AFFL coverage, and the network is embracing the “Madden-style” coverage and the production elements it debuted last year, including using a SkyCam as the primary game angle, deploying RF Steadicams inside the huddle, rolling out customized SMT virtual graphics across the field, and miking players throughout the game. The 12 teams featured in the USOF Playoffs are composed of eight amateur squads in the America’s Bracket (derived from four rounds of play that began with 128 teams) and four teams captained by celebrities in the Pro Championship Bracket. NFL Network’s USOF coverage began with the America’s Bracket Quarterfinal last weekend from Pittsburgh’s Highmark Stadium and continues with the semifinals this weekend at Atlanta’s Fifth Third Bank Stadium, the America’s Bracket Final and Pro Bracket Final on July 14 at Indianapolis’s Butler Bowl, and the $1 million Ultimate Final (featuring both bracket champions) on July 19 at Houston’s BBVA Compass Stadium. The 11 AFFL telecasts on NFL Network will feature SMT virtual graphics, including the Go Clock. The 11 AFFL telecasts on NFL Network will feature SMT virtual graphics, including the Go Clock. The 7-on-7, no-contact 60-minute AFFL games feature many of the same rules that average Americans know from their backyard games. The same players are on the field for both offense and defense, and a team must go 25 yards for a first down. There is no blocking; instead, a “Go Clock” indicates when the defense can rush the QB (after two seconds) and when the QB must release the ball or cross the line of scrimmage (four seconds). There are also no field goals (or uprights, for that matter), and kickoffs are replaced with throw-offs. By using the SkyCam for play-by-play, RF Steadicams on the field, and player mics, the AFFL and NFL Network are focused on providing fans unprecedented up-close-and-personal access to the action on the field. The upcoming NFL Network AFFL productions will deploy Game Creek Video mobile units and feature an average of eight cameras: the SkyCam system, two traditional 25-yard-line angles for isos, a mid-level end-zone angle, one handheld high-speed camera, a jib on a cart roving the sidelines, and two RF cameras (Steadicam and a MōVI). The Go Clock, designed by SMT specifically for the fast-paced AFFL, is also back after playing a major role in defining the league’s production style during its pilot game. The system synchronizes with in-stadium displays to indicate when the defense can rush the quarterback. “The Go Clock was a big success, and we’re bringing it back this year,” says Evans. “We’re also introducing a line of scrimmage that will change color when [the defense] is able to rush. So the virtual graphics are still there and play a big role [in the production]. The same SMT virtual 1st & Ten line used in NFL broadcasts will be deployed from the company’s Camera Tracker system, working in tandem with SkyCam to give viewers the “Madden-style” play-by-play angle used several times by NBC Sports last NFL season. SMT’s Design Studio also designed and implemented the AFFL graphics package — including show open and score bug — and the virtual-graphics package. SMT’s clock-and-score technology is made available via its dual-channel SportsCG, a turnkey graphics-publishing system that allows greater autonomy via a second-channel laptop that can be operated remotely. In addition to producing the score bug, the SportsCG offers real-time, in-game offensive and defensive statistics powered by SMT QB Stats (the same system used for NCAA and NFL games). In addition to the virtual elements, the AFFL has enhanced the physical first-down marker used on the field, so that it digitally displays the down, play clock, game clock, and possession arrow. The system also emits an audible alert when the rusher can break the line of scrimmage after two seconds and when the quarterback has to throw the ball after four seconds. Aside from the production elements, the AFFL also offers a host of great storytelling opportunities surrounding the squads of Average Joes on the field. McNeely, who knows a thing or two about telling the stories of unknowns on the field, having produced a dozen Little League World Series for ESPN, sees the AFFL as a one-of-a-kind storytelling opportunity. NFL Network’s commitment to the AFFL goes well beyond just televising 11 games, however. Not only do the telecasts feature NFL Network talent like Good Morning Football’s Kay Adams (serving as sideline reporter throughout the tournament) and NFL Total Access host Cole Wright (calling play-by-play on July 14), the network is also incorporating AFFL segments into its daily studio programming, social-media channels, and digital outlets in an effort to appeal to football-hungry fans during the NFL offseason.